I have been wanting to write this post for a long time, but it seems every time I actually sit down to write, something intervenes. A new announcement from Sikh Activist Network arrives, a Sikh brother has been attacked in his taxi, the Canadian government is again trying to kidnap Laibar Singh or the government of Haryana has decided to arrest and torture an innocent Amritdhari sister - or some such emergency that needs my immediate attention. I am temporarily putting aside the slightly gloating, but also tragic post I want to write about the firing of KP Gill and a really interesting article about how 9/11 made us rethink so much. The SAN announcement has been posted, and, as far as I know, none of the others need my attention this minute, so I am setting aside the time to write a post just for my own pleasure. I hope our loyal readers enjoy it, too. Being lost is worth the coming home. I enjoy being a Sikh. Enthusiastic, sure, but I don't think extreme. And I'm 100% certain not unreasoning. 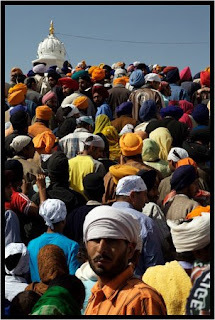 I love the beliefs, of course, the prayers, the songs, the Panj Kakkars, all the usual things. But it goes beyond that. Being a Sikh is a complete package, a 24/7 experience. The sounds of the tabla and the harmonium. The voices of the Sangat singing kirtan. The voice of the Sangat Jaikara-ing. The sweet sound of the words of Guru Ji in the air. The dull roar of the langar hall, the wonderful smells that waft their ways in and through. Even more, the many people, dare I say colourful characters, I have met? Let me skip over my own family; I have written a great deal about them, much of it in my personal blog, sometimes - 2. Feel free to go there and check out the labels Family, Dad, Mani, etc. I think also about the lovely Babas that I am so fond of. 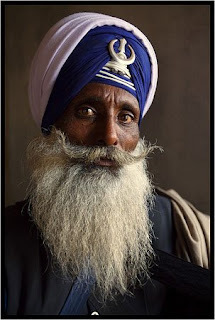 The gentleman I found with his turban neatly tied and his hair hanging to his waist. The other gentleman who was, in a confused state, imperiling his life by making - indecent - proposals to women. 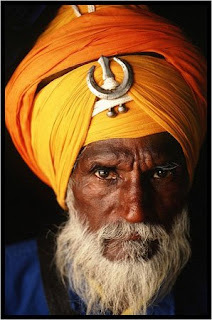 The gentlemen I see daily walking, just as my own Dad did, backs straight, eyes strong and clear, gait sure, turbaned heads held high and proud. These send a thrill of pride through my whole body. 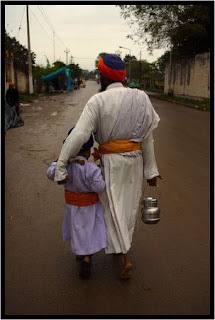 And no Baba he, the Nihang in Amritsar that rescued a seven-year old girl, who, ashamed of her shorn hair, ran away from home, and then carried her back to her family on his broad shoulders! The women I have known, with or without dastaars. (More are tying dastaars these days, a trend I heartily applaud.) My dear Kaurs, the nurses who saved my life two years ago and have continued to be my close friends. Several I know who wish to remain in ghostly shadows, those who, like myself survived the carnage in Delhi during November, 1984. The ones I have never met, but who are, nonetheless, my sisters who survived and raised their children, somehow salvaging some chardi kala to keep going on, day after harrowing day, seemingly forgotten by the Saadh Sangat, ignored by the wealthy SGPC. These women are among our greatest, bravest heroes and deserve our highest praise - and our material help. I love the Vaisakhi celebrations, just concluded. I love our contentious arguments by people that just refuse to give in. I love the giggles of the Aunties to the young bride. I love being a part of all this. Oh, I could go on and on. 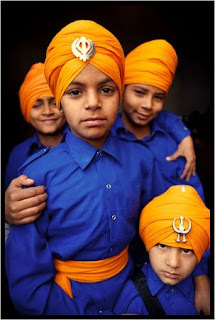 Sikhs are a colourful, varied lot. It is a sobering thought to me that I fit into such an interesting, varied group. Along with many other of our brothers and sisters, I was called upon to face the worst thing I could imagine, the violence and horrors first of Bluestar and then of whatever you want to call the carnage in Delhi. It might be argued that being a Sikh put me in those situations. What cannot be argued is that being a Sikh gave me the strength and courage to survive and want to go on building a life, wanting to do something to improve the world in which I live. Believing that I could make a difference. Knowing that whatever may happen, I don't have to give up or give in. To know that Guru Ji loves me and will give me whatever strength I need. All this just for the price of one worthless head! 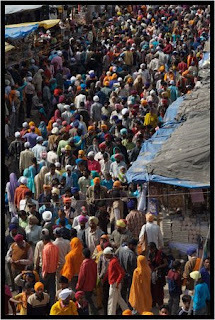 I hope you enjoy the Nihung Ardaas and some more pictures by Charles Meacham. Please check out his website at Charles Meacham Photography. BTW, in the time I have written this, two hours, my inbox has grown from 16 to 54, mostly from GLZ and IHRO, Sikh groups both.